In the issues department is the Dr. LED Mars Dome Light LED Conversion Kit I just purchased. At $24 on sale, it seemed like an easy solution for some of Gizmo’s less critical dome lights, where 60 lumens of warm white (3200 K) at less than a quarter amp would be OK. The kit also has the internal voltage control — 10 to 28 volts — that seems characteristic of better LEDs. But I didn’t anticipate how that single extra bright pinpoint LED would interact with the diamond-pattern glass lens on my particular dome lights; the net effect is like disco lighting! 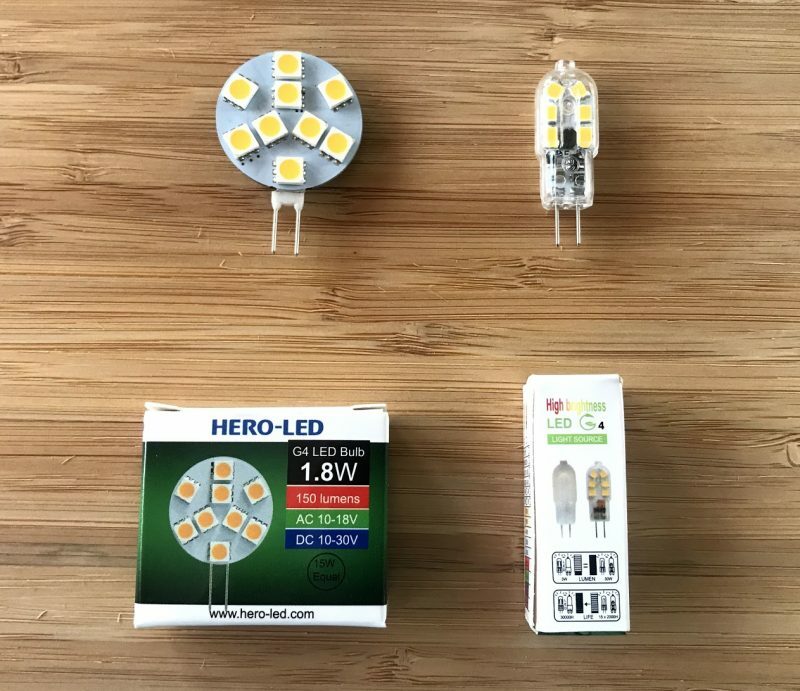 I’ll find some obscure spot for this LED and will still be glad for the power saving every time I use it, but the point is that you have to consider not only LED light output and color but also how the light is distributed. Other outlets where I’ve found good LED replacement bulbs and fixtures are Sailor Sam’s and Marine Beam — which now has fluorescent tube substitutes (hurray!) — and I’m sure there are many others (your favorites?). 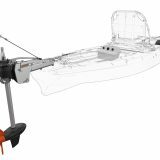 But why settle for just a replacement of your current boat lighting when it seems quite possible to have well balanced LED lighting that’s very bright when you need it while still dimming down to almost invisible? Newer and bigger boats with their multiple recessed fixtures and ganged dimming (good selection at Yachtlights) are already going in that direction but I’ve yet to find an easily sourced switched fixture that does what’s possible. Gizmo’s many dome lights are particularly vexing as the wiring is buried in bunged cherry trim (as shown here) so adding a dimming circuit is near impossible, but I think a lot of boaters would be happy with an individually switched and dimming LED fixture if the performance/value equation was right. I’m even experimenting with fashioning my own. What you see below is a wooden lamp base sourced from a crafts outlet which I’ve hollowed out further to accomodate a LIET3 Series fixture and a little control for its built-in 1-10v dimming also supplied by the good folks at OceanLED (Liet’s corporate sibling). This setup tested very well in my dark lab against the other bulbs discussed, particularly the 3 Watt reading light with its similar specs. But I did find these German- built prebit d2 LED fixtures on the Web and they sound great. Consider nine 1 watt LEDs producing 670 warm white lumens — more than three times the 200 lumens claimed by the LIET3 — with infinite dimming via an internal soft switch and secondary red lighting if you want it. However, I can’t find any source for these fixtures online, and they may be way too expensive anyway. 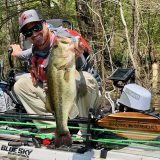 What’s your concept of the perfect LED boat fixture and/or what are you finding useful? Next story Siren Marine, best cellular boat monitoring yet? Another factor with LED lighting I didn’t get into is EMI and RF interference. It is possible and it’s not easy to test. When I put a handheld VHF running a weather channel next to the test LED bulbs, I can occasionally hear a slight increase in static, but if the signal is really faint, it can go away altogether because the interference has kicked in the squelch. In other words, interference can sometimes be heard but other times cause actual traffic not to be heard. Ben — have you looked at the Alpenglow LED lights? Nice, well-built gear, for a not-unreasonable price. I just installed a bunch of Alpenglow fixtures in my saloon and pilothouse. To say I am pleased would be a serious understatement. The fixtures look great, the light is warm and very well diffused and, at high, really quite bright. I also have two of their wall mounted reading lights which are just great. The company is small and very nice to work with. Highly recommended! I was helping on a delivery of a Gulfstar 50 last November from Long Island to Puerto Rico; seas were rough, and virtually ALL of the Sensibulbs fell out of the reading lights. The bi-pin thing just doesn’t work on a large assembly like the Sensibulb. CURRENT: I did well with MarineBeam, highly recommend them. Saved power plus I increased the brightness in the salonn. The purchasing process including some consulting from the owner who took my requirements and picked out bulbs for each fixture. E.g. For example in each fixture I designated if my priority was saving power or getting an even brighter fixture. In each case I was assured the bulbs selected for marine use would not cause RFI problems, neither with the VHF, navigation, or entertainment systems. I agree that LED’s on board is a no-brainer. But it depends on how much each fixture is used. Salon and galley lights are obvious candidates for conversion to LED, but what about closet lights that are on for only a few minutes per day? The anchor light is another obvious one, but what about navigation lights on a power vessel that are only on when the engine is running? Perhaps someone smarter than I can come up with a formula to calculate cost of the bulb vs energy saved, vs increased bulb longevity, but meanwhile a decision on which fixtures to convert is purely subjective. Two years ago we changed about one third of the bulbs on our trawler to LED, a decision that we have never regretted. One more thing. Anyone looking for marine LED lights should look at the low voltage garden lights sold by many of the big box stores. We installed a 12V LED rope light under the bed. It came with a little transformer to drop voltage from 120 to 12, but we wired it direct. I am sure you can figure out what this light is used for. If you don’t mind the cool white color, MPJA.com has some nice LED circuit boards with 87 lumens output for $12.95. I’ve used them for about a year in old fixtures without problems. Patrick – While Ben did have the undesirable disco ball effect, I have had good results on all my lights, all of which have either simple clear lenses or white diffusers. Rick R – Sounds like your lucky with that rope light (pun intended), but if you used an inverter to get the 120VAC, that would be a problem for most of us. The power savings benefit would be demolished. Rick R – What formula? I think you missed the point of what to do with the “savings”. Think of the savings as Ahr (Amp-Hours), Volts x Amps x 1 hour, that can be used instead for some other creature comfort, new electronics you learn about on Panbo, or just fewer hours of droning engine or generator noise making replacing used Ahr. Then that savings becomes priceless, unless you have the means to upgrade your electrical system. For example, the energy savings by LED lights for one night can power a laptop computer and internet access for a good many hours. Prebit has a very nice line of LED lights. I bought a batch of switchable red/white dimmable recessed tilting units. Very happy with them. Calibra in the is their UK distributor. Imtra in the US. Hella has the best LED lights on the market. ALL my Navigation lights have been replaced with Hella NaviLED Pro. ALL interior lights are EuroLED. Spreader lights are Hella Module 70. Very happy with this decision. Dan, the rope light is not connected through an inverter, but is wired directly into the 12V system. Calculating the number of Ahr saved per fixture converted to LED is the easy part. Putting a value on the reduced generator time is much more difficult, and depends not just the cost of running the generator, but on the annoyance factor. But you are correct Dan. Every Ahr saved increases the time I can spend surfing Panbo. I have converted all my lights to either LED or compact florescent. Although the energy saving is dramatic, until someone invents an ultra low power refrigeration system, the savings are insignificant. I called Alpenglow yesterday and found out you can send in your old Alpenglow compact florescent fixtures and have them converted to the new LED’s. I plan on doing this as soon as my boat is back in homeport. The Alpenglow quality and service has been outstanding so I expect the LED lights to be the same. I used MarineBeam bulbs in the CRI90 variety throughout my boat and am very pleased with the results. Very natural looking, better than others I tried first. I also put about 8 feet of Imtra 12v LED rope lighting under the cockpit table … it looks awesome and the total draw is something like 6w. It reflects down onto the white cockpit creating a big glow and then down off the awning. Perfect dinner lighting. And 100% waterproof! Recently Lowes in Florida started carrying LEDs for interior lighting. They seem to be high quality and very reasonably priced. I am on a sailboat and often live on the hook for several months at a time so LEDs and power consumption have been near and dear to my heart for quite some time. I was definitely an early adopter in this area. A couple of tips I have found useful. Most LED bulbs are designed to last a lot longer than the traditional incandescent bulbs they are replacing. Since they will often have a life expectancy in the 10s of thousands of hours I usually cut out the socket from the light fixture and make a mechanical connection (crimps or solder). I glue or use the foil AC tape to actually hold the bulb in place in the light fixture. For the reading lights with a 2 prong (M16) type connector I use a dab of 3M 4200 to hold it in place and keep it from beating out when in rough seas. Once you change your perspective on how long these bulbs are designed to last you will not be subject to picking lamps based on your current socket / fixture. You can even look at Lowes or Home Depot for their clearance lights such as track lights. You can take these apart and use a LED puck light glued in place. 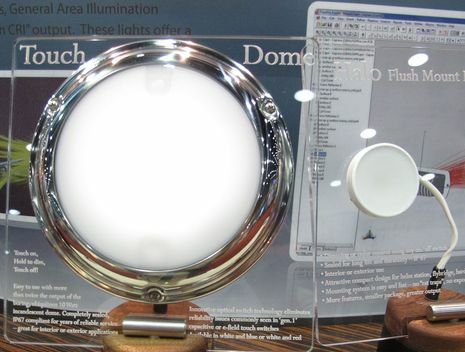 You can get some very nice high end looking light fixtures on your boat for very little money. I also use round LED switches by each light (like this one http://www.discount12volt.com/servlet/the-177/The-Install-Bay-IBRRSB/Detail ). You only have to drill a round hole to mount these. I wire all of the lights through the individual switches and then back to a master switch for the entire cabin. That way you can set up the lighting for however you like it and then turn off and on the main cabin switch to control all of the lights. It also really cuts down on accidentally leaving a light on in a cabin. Bought one and like it very much. One other place that I have been buying LED’s for that past 6 years at a fraction of the prices the marine businesses have been selling for is http://www.superbrightleds.com. They have so many selections in base types for all the different fixtures we have. They also keep adding to their options as well. Geez, kids, you’re costing me money! After all the raves, and some serious perusal of the AlpenGlow site, I just purchased one of their overhead dual level LED models with dual level red night lighting too. It’s destined for Gizmo’s galley. I also heard back from AlpenGlow regarding the new dimmable reading lights. They’re rated 400-600 lumens max with nine 1 watt LEDs and they sent an interior picture of an older model that looked neatly done. And I think I’ll get to test one. I’m hoping that both these fixtures will be examples of my theory that LEDs can not only be more energy efficient but also better lighting for our boats. 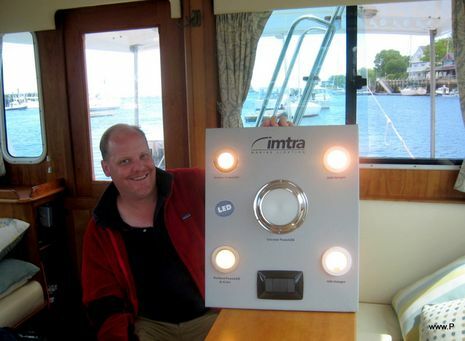 Several years ago, we installed Imtra LED light fixtures throughout our 44′ sailboat. 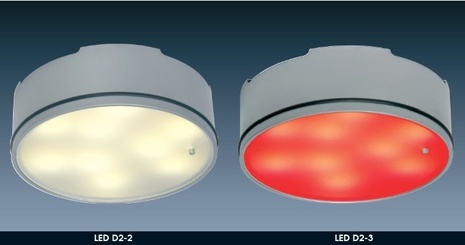 This includes everything- overhead dome lights, reading lights, and spot fixtures with red/white. The dome overhead and spot lights are dimmable, which is a nice feature. We consider these lights to be one of the best, most useful upgrades we’ve done to our boat yet. Since we live aboard, we use the lights all the time, and since we live on the hook for part of the year, the power savings has been great (we don’t panic if we accidentally leave a light on when we leave the boat). The fixtures look great too and are very well made. The light is warm, pleasant, and bright. Prebit has a large booth on all German boat shows. The prices are high but not excessive so not entirely focused on superyachts. The single button works as an on/off switch when pressed momentarily and as a dimmer when pressed longer. The cool part is that when turning it off in a partly dimmed state, it comes back on at that same state. I would think that they ship to the US in case the Imtra route does not work. I have purchased from them a few times. I am almost done converting the interior lights to LED. My flush mount overhead lights gave no problems with light patterns as there is no diffuser just a whiteish sandblasted (frosted) glass cover which works well. I learned the hard way that light color changes from one manufacturing batch to the next by a significant amount (or human eyes are super sensitive to small differences when displayed side-by-side). So when converting several lights of the same type in the same space, make sure to buy all LEDs from the same batch and buy a spare in case you need it a year from now as no amount of searching and trying will get you the same color again and the perceived difference in color is huge. At last year’s METS I found and bought the most beautiful nav table light from Cabin Denmark (item “DOUB-LED” on the page http://www.cabin.dk/Default.aspx?tabid=523&language=en-US). It is most lovingly built from polished stainless steel and not at all excessively priced considering the amount of labor that must have gone into it. The AlpenGlow LED fixtures are very impressive! The materials and workmanship are quite good and so is the light color, spread, and power. High power on the overhead tested right about at spec — 7 Watts, or .6 amp @ 12.2v — while the low power red is almost imperceptible on the meter. 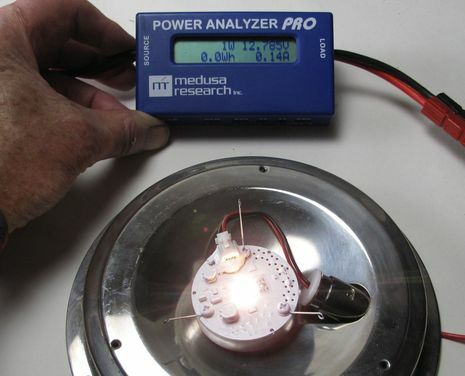 The reading light tested at 4W or .4 amp @ 12.2v and dims to nil. I’ll know better when they’re installed on Gizmo, but I’m pretty sure these can be substantially brighter than the incandescent fixtures they’ll replace at half the power cost and with low light/power options. 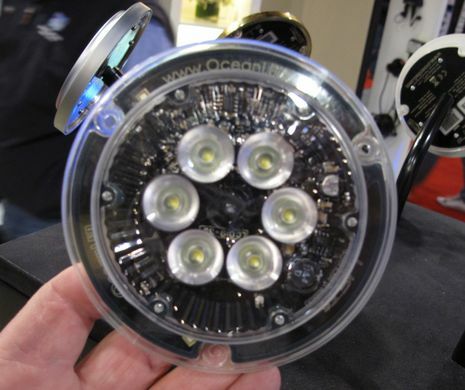 Ben mentioned that he couldn’t find pricing on the Prebit D2-3 nice looking light that he found. 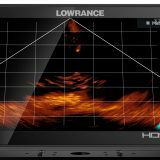 Here’s a link to a German web retailer (different to the one Henning provided – this has pricing listed). The D2-3 in warm white is Euro 237 (about US$310), but that includes the 20% VAT (that’s like sales tax for those who don’t know). I think the lights look fine, and the red & dimming functions are very useful. For our boat the style doesn’t work. We changed to Alpenglow lights throughout the boat about 2 years ago. The style is perfect for our 30 year old sailing yacht. For the overhead lights they only had LED for the red, and CFC for the white. However, the CFC is great, and uses about the same power as the new LED (about 0.1A more for the same lumen output and same colour temperature), so I don’t see a reason to change at this point. We got LED for the reading lights. Because the energy saving was so huge, and the light output much greater, we found that we have significantly more light available for about 10% of the power usage of the old incandescents. Also, because we’re now not so worried about leaving lights on (as Jen Brett also said), we decided to add fixtures to give us more flexibility. All-in-all, we win in every way. Re your concept for perfect lighting, and a little tangential to the lighting topic: We’ve actually achieved some of your perfect lighting concept through totally re-wiring our yacht with BEP’s C-zone power switching over an N2K network. I haven’t finished installing it yet (it’s a total re-wire project that was badly needed, so it’s taking a while – actually the “un-wiring” of the existing systems is the harder part), but it does enable a lot of the things you mention (although I don’t think I’ve yet discovered all of the possibilities). – and all of that is totally customisable because it’s 100% programmable. Anyway, we aren’t implementing all of the above, but it’s all software programmable, so we can introduce new things as we become more comfortable with the system. We’ve implemented it on a separate N2K network with bridging to our instrument network to share data, and that seems to work well. It does save in cabling (and huge wire clutter savings), but if you’re implementing it yourself, you need to be technically savvy, and it is a steep learning curve. Don’t know if you can do anything with Bluetooth, but I wouldn’t be surprised if you could. The “KISS” guys will no-doubt shake their heads and mutter into their overly long beards filled with granola, but I actually think that this system is simpler than traditional wiring, and would add value whether you have 10 circuits or 1000. I’ve lost count of the number of times I’ve spent hours trying to track down an electrical fault in the old wiring because not all the wires are labelled, and the rat’s nest is tangled so I’ve had to finger trace each power and earth wire, and then one of the wires ends up going absolutely nowhere. Also, each circuit has a back-up physical fuse and manual switch which can be brought into play if the electronic controls go down. So I sound a bit like an advert for BEP (now Navico owned), but I’ve got to say that the increased capabilities provided by these distributed power systems answer many previous dreams (I know, sad to be dreaming about boat electrical systems – oh well). And don’t ask about cost yet – I’ll add it up at the end but am taking a “don’t look, can’t cause a heart attack” approach right now because you either do it, or don’t – you can’t be half pregnant. A late commnet but wanted to added my 2 peso’s worth. We have converted almost all our onboard lights including the Nav lights to Bebi lights. They are terrific, lifetime warranty and hardly draw any power at all. Made in Fiji and shipping usually take about 10 days. They are easy to install in exisiting lamps with a dollop of silicone. 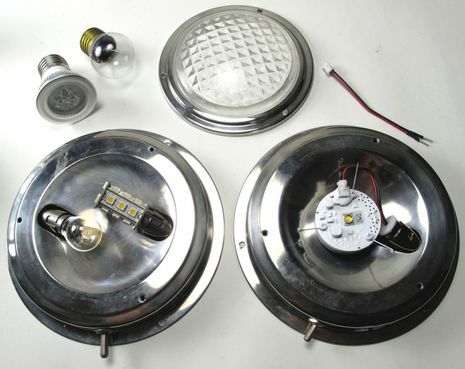 Plus the site has a great DYI section for those inclined to convert exisiting lights. There anchor lights are by far the best we have seen. In addition to the white one (to be legal) we also have a blue one on the stern and on the bow to keep sleepy pangeros from running into us. 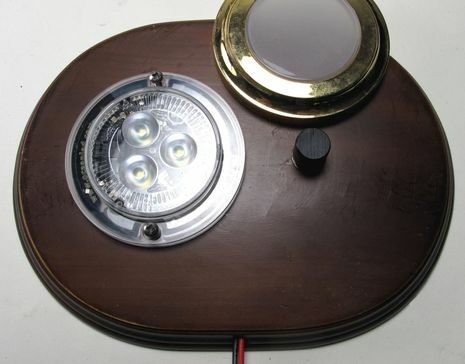 I have retro fit a few sailboats including my own with Cantalupi LED overhead fixtures.. they made a “custom” model a mixture of two recessed lights for overhead uese… first I like to have control, so dimmer was manditory and Cantalupi makes a dimmer modual for momentary switches. I had them take a 6 watt warm LED add to the “Bob” fixture with frosted glass cover. Recessed light is approx. 3″ in diameter with a 2.5″ cut out. Fixture has heat sync buit in well made, has lots of light and dimmer works fine. Low profile stainless steel trim rings still look new after more than two years. What I liked is they made a fixture using components from two models to make one, quality is excellent, cusotmer service was good…Prices were very high but that comes with “quality”. I own a 2000 Carver 404 CMY and desire to change all my interior lighting to LED. Presently, my lighting throughout the interior of the boat are a series of incandescent bulbs in small ceiling fixtures. The lights run off battery or, when docked, off of shore power. Unfortunately, the plastic rings that secure the glass lenses are brittle due to age and heat from the bulbs and are breaking.  I would like to replace all the fixtures I have with LED fixtures. Knowing the boat that I have, and the lighting that came with it, do you have an LED direct replacement for these fixtures? Thanks in advance for your time.